Have been eager to work with Sharepoint since MOSS 2007. But just last week got a chance to start working.. I personally have heard lot of ghost stories about Sharepoint installations ever since 2007.. So I wanted to try it out my self. Once OS (either Windows 2008 R2 or Windows 2012) is installed. Please proceed as per following steps to install Sharepoint 2013 / Sharepoint Foundation 2013. 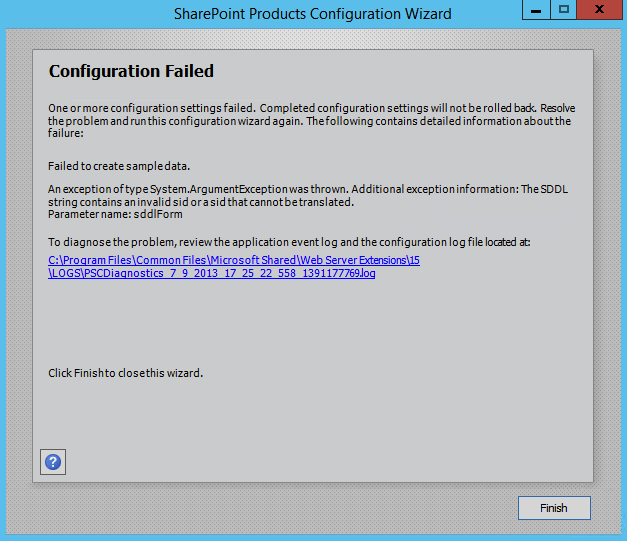 Note: You can't install Sharepoint 2013 / Sharepoint foundation 2013 in client operating systems. You will need server edition. Install .NET 3.5 SP1 and .NET Framework 4.0. Configure Application Server Role and Web server role in the Windows. Click on “Add roles and features”. On the “Before you begin” page, click “Next”. Select “Role based or feature based installation” and click “Next”. If it isn’t already selected, select “Select a server from the server pool”, and the server that you are currently working on. Then click “Next”. On the “Select server roles” page, check “Application Server”, “Web Server (IIS)”, and (EDIT:) “IIS 6 Management Console” (under Web Server (IIS)->Management Tools->IIS 6 Management Compatibility->IIS 6 Management Console.). NOTE: When you check “Web Server (IIS)” or “IIS 6 Management Console”, another dialog will pop up, asking “Add features that are required for ?” Click on the “Add Features” button here. This will return you to the “Select Server Roles” page. After adding all 3 roles, click “Next”. On the “Select features” page, expand “.NET Framework 4.5 Features” group by clicking on it. In here, check “ASP.NET 4.5″. On the same page, check “Windows Identity Foundation 3.5″. Click “Next”. On the “Application Server” page, click “Next”. On the “Select role services” page, check “Web Server (IIS) Support” and click “Next”. When the “Add features that are required for Web Server (IIS) Support?” dialog pops up, click on “Add Features”. Click “Next” again to go to the next page. From the “Web Server Role” page, click “Next”. From “Select role services”, click “Next”. Wait for feature installation to complete. When it does, you can click “close”. If the server doesn’t restart automatically, reboot it. Install Windows Updates (at least recommended) and restart the server. You can install all of the above except item # 6 and #10 in the prerequisite list by clicking on same. Once you have mounted it, you can see "prerequisiteinstaller.exe" in the root folder of Sharepoint 2013 mounted drive. Type following command to install and start product configuration in sharepoint 2013.
your prompt(SharePoint image location)> Prerequisiteinstaller.exe /AppFabric:"\setup.exe" /KB2671763:"\AppFabric1.1-RTM-KB2671763-x64-ENU.exe"
You may get error some times in that case just prefix the command with "./"
The above will complete the Sharepoint 2013 pre-requisite installation and Product installation can be invoked or Pre-requisite installer will launch the product wizard. When you invoke product configuration wizard (SandBox installation mode), the server will launch the process and in all probablity it will fail in step 5 with following image. Follow below steps to resolve and re-run the wizard. After this step you can, see that Sharepoint 2013 installation will be successful and you can proceed to launch "Central Administration" site to configure required services.